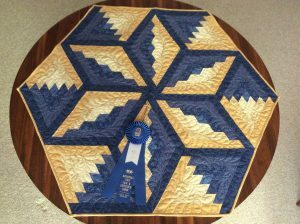 BEST of SHOW…Doris Brown, of Fairfield Bay is very pumped up and for good reason, She is the proud winner of Best of Show at the Arkansas State Fair for the Tabletop Quilt. The quilting bug really bit Doris when she moved to Arkansas. It is her hobby or go-to pastime. She has a fascination with patterns, color and construction techniques. Doris is still learning by trial and error and from my fellow enthusiasts from the Piecemaker Quilt Guild.